THIS SUNDAY 12/2! 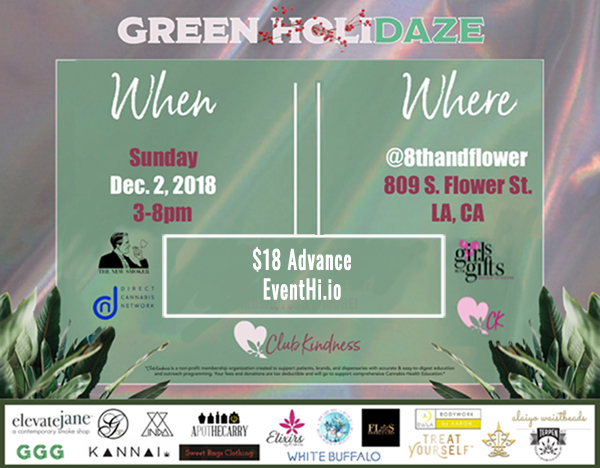 Let’s mingle in downtown LA for HoliDAZE! We’ve got a fabulous venue and LIVE Music! Bring your wallet because there will be 15 amazing vendors exhibiting including WhiteBuffaloSpirit.org. We’ll have our famous White Buffalo PEACE CBD Massage primer on sale for gifting, but you must be present to take advantage of the sale. Limited time only and dependent on inventory. If you’d like to make a bulk order of PEACE for holiday gifting, get in touch on Instagram @WhiteBuffaloSpirit or using the form below and let us know what you’d like to order. Take 10% off advance ticket prices with code WhiteBuffalo using the button below. Arrive early to reserve your spot for an intimate chat with industry professionals (enjoy a 20 minute small group private discussion with any or all of our Green HoliDAZE Speakers – see link above). Consider making a donation to our beneficiary Girls with Gifts and participating in our silent auction! The mission of Girls With Gifts, Inc. (GWG) is to cultivate the talents of young ladies, ages 12-18, with emphasis on the arts, education, and self-empowerment. Our organization focuses on personal development, mental health, service to others and scholastic excellence. Following the mantra, “Reach Back, Pull Forward,” GWG is an organization focused on changing the world through passionate young women, one gift at a time. 7:15pm Steven Kellye (acoustic guitarist and singer) is performing live! GT Kombucha in the house!